Hidden Danger - The Chip's Challenge Wiki - The Chip's Challenge Database that anyone can edit! Hidden Danger is the 59th level in Chip's Challenge 1. 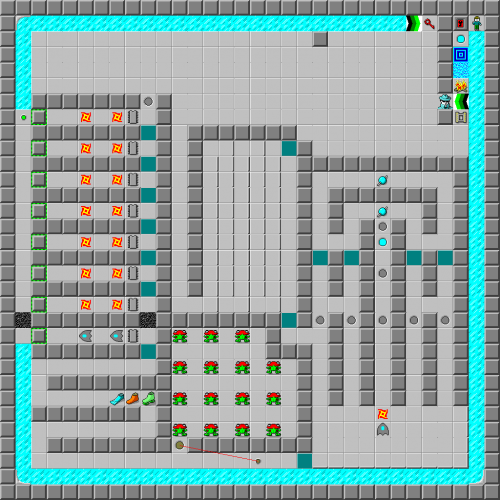 This level was designed to contain multiple solutions, most of them with no chips required; it is the only CC1 level that allows socket avoidance in Lynx. Slide all the way around the level, hold the south key to step off the force floor and avoid the red key (in Lynx, the level is slightly less busted because the key must be taken) and pass by the chips all the way to the blue wall, then 5R and north to a teleport. Without boosting, Chip would have had to take the red key due to the rules of force floors, and Chip would now open the red lock. Instead, partial posting moves Chip across the teleport, and a final >D move ends the level. In Lynx, Chip must travel up column 2 instead of 3, pass the bouncing walkers and then make the >D move, scoring 366. This page was last edited on 9 March 2019, at 17:27.